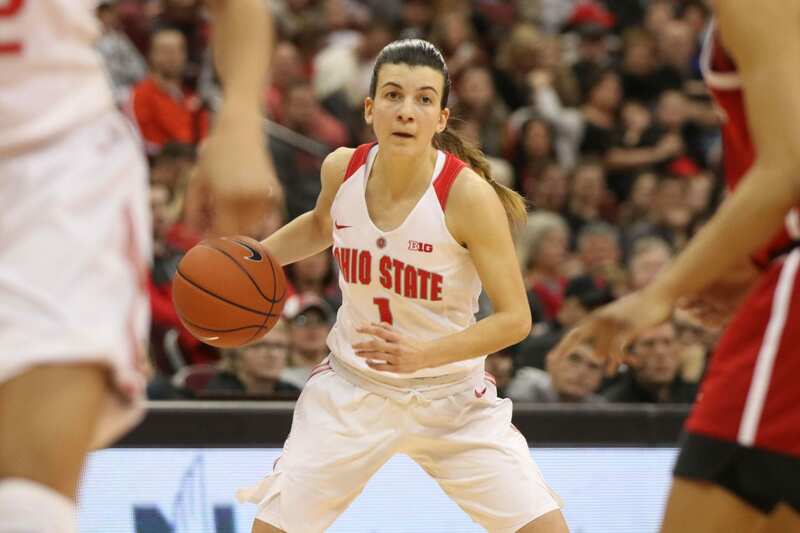 Life on the bubble isn’t something the Ohio State women’s basketball team is used to. Redshirt senior forward Makayla Waterman has never missed the NCAA tournament in her four seasons at Ohio State, and head coach Kevin McGuff hasn’t missed out on the big dance since his first season with the Buckeyes in 2013. With conference tournaments in full swing and Selection Sunday only a few weeks away, it is crunch time for an Ohio State team that hasn’t yet secured its tournament berth. With the opportunity to play as many as four games in the Big Ten tournament, any one of those matchups could mean the difference between moving on and watching the NCAA tournament from home. Ohio State’s opening matchup comes against Wisconsin, who the Buckeyes swept in the regular season by scores of 70-68 and 61-50, and they will get another crack at them on Thursday. Ohio State enters the tournaments as a No. 5 seed after finishing with a 10-8 conference record during the regular season. The Badgers entered the tournament as the 13 seed and knocked off Penn State 65-57 to move on to the second round. The past two matchups between the Buckeyes and Badgers have leaned heavily towards Ohio State, with Wisconsin unable to stop the Buckeyes from scoring. In the first game, freshman forward Dorka Juhasz went off for a 21-point, 15-rebound double-double in addition to three other Buckeyes scoring in double digits in the 70-68 win. Just 11 days later, redshirt senior guard Carmen Grande dropped 17 on the Badgers while Juhasz again notched a double-double, this time with 10 points and 14 rebounds in the 60-51 victory. While Wisconsin’s offense doesn’t necessarily light up the scoreboard — it is ranked No. 12 in the Big Ten in scoring offense — the Badgers do have a pair of potent forwards in senior Marsha Howard and freshman Imani Lewis who are both averaging double-digit point totals. While Howard and Lewis have been able to find the basket, the overall shooting of the Badgers is poor. Wisconsin shoots just under 40 percent from the field, 28 percent from 3 and is only shooting 58 percent from the free throw line. The Badgers are better on the defensive side of the ball, only allowing 63.5 points per game, slightly more than the 62.1 points that Ohio State averages on offense. For an Ohio State team that struggles on the offensive end, Wisconsin will not make things any easier. The Badgers are allowing their opponents to connect on 39 percent of their shots from the field this season. If the Buckeyes want to move on in the tournament, Grande and the rest of the graduating seniors will have to step up to ensure they can find the basket against Wisconsin’s stingy defense. Ohio State will take on Wisconsin on Thursday at 2:30 p.m. at Bankers Life Fieldhouse.